New home construction is a journey of dreams, decisions, new friends and neighbors. In 2011, Prairie Trail was named Top Residential Neighborhood by DSM Magazine. The beautiful custom homes built by the very first residents were showcased at the 2008 Home Show Expo. Since then, more than 300 homes have been built in the neighborhoods of Prairie Trail. Most are custom builds, but today our Prairie Trail builders are also building new spec homes. And they can’t build fast enough! One aspect of new construction, which makes it a very popular choice over existing resale or remodeling, is the difference in lifestyles today. There has been a significant shift in home design to accommodate multiple-activities, casual entertaining and a conscious effort to conserve. The open floor plans, drop-point or cloakroom, high energy-efficiency choices, natural woods and stone products and sophisticated technology are just a few examples of how these lifestyle trends have impacted home design. People who choose new construction spend time — sometimes years — in the process of considering locations, styles, lots and plans. Thinking and Dreaming. If that’s you, we invite you to enjoy the website and learn more about building your home in Prairie Trail! Here are just a few steps to consider. Making your dream a reality has everything to do with choosing the right builder. Beyond the price-points, availability and quality, most homeowners agree that the number one attribute of a great match is being able to connect with a builder who listens. You want someone who takes time to hear your ideas and respond promptly. There are always details and challenges. The best builders work with a proven process, keep you informed and solve issues promptly. A signature feature of Prairie Trail is that the streetscapes are as beautiful as the individual homes. There are four architectural styles to choose from. To maintain a harmonious look, the Prairie Trail pattern book was developed in 2005. It’s very detailed with a color palette for each home style, yet offers endless options of how it all comes together. Each new home is presented to the Architectural Review Board for approval. Learn more here. 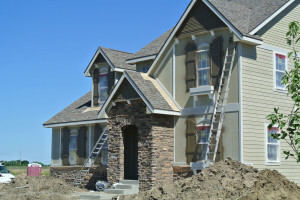 Prairie Trail builders are experts at working with the home styles, covenants and the Architectural Review Board to help new homeowners realize their dream. The first neighborhood to open in Prairie Trail was Precedence at Prairie Trail. The Heritage neighborhood is near Ankeny High School and Southview Middle School with a few beautiful lots still available. Precedence West Plat 3 and Pointes West are on the west side of the development near Cascade Falls Aquatic Center. The Estates at Prairie Trail is the newest plat to open. Building is underway in the Estates, site of the 2015 Home Show Expo. See more info & maps about the neighborhoods here or email us at info@prairietrailankeny.com for up-to-the-minute info on the various lot sizes and price points available.. Your builder will be able to help you match the different lot choices to your preferred home style and location. There are definitely stages in the process, like staking the ground and pouring the foundation at the beginning. Landscaping comes at the end. It feels like so much is happening all at once as the interiors and exteriors take shape simultaneously. Many choices need to be made well in advance. It can be exciting, overwhelming or both! You might enjoy reading about how some of our Prairie Trail residents enjoyed the process of homebuilding. While each story is different, you may find insights and ideas for your project. If you’re on a desktop computer, click on the list at right for all the current stories. Homeowner Stories are also listed under the Live Here tab above. Living at Prairie Trail is a lifestyle as much as an address.You’ll probably meet your new neighbors during the homebuilding process. The people and businesses of Prairie Trail are eager to welcome new neighbors. Make sure to learn about the many activities and connections in this community as you consider whether Prairie Trail is right for you. Contact Ashley Johnson, Marketing & Sales Director with questions about available lots and what’s coming open next! The new Prairie Trail magazine is out!